Scanpan cookware is highly regarded by professional and amateur chefs alike for their quality, durable, and environmentally friendly nonstick cookware. I love Scanpan. Scanpan fuses a ceramic titanium compound at 30,000 degrees Celsius to a compressed aluminum core. The result is a nonstick surface, not a coating that can flake or peel, that is dishwasher safe, metal utensil safe, and environmentally friendly. Scanpan cookware is backed by a lifetime warranty. Originally Scanpan only had their nonstick surface available in the Classic and Professional series. Now, Scanpan cookware offers both the environmentally friendly nonstick surface and healthy stainless steel combinations in their CSX and CTX product lines. Scanpan CSX cookware sets have both stainless steel and nonstick skillets included! That is what experienced cooks have been begging for a long time. 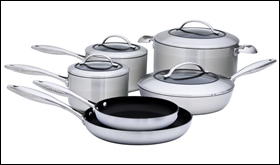 Denmark’s leading cookware manufacturer, Scanpan, introduced a nonstick process that is PFOA free. Since the Scanpan nonstick surface is fused to an aluminum core, it is not a coating that traditionally requires PTFE and PFOA compounds. From the start, Scanpan cookware is PFOA and PFOS free. Scanpan cookware offers what could be the best of both worlds, a nonstick surface for easy cooking and cleaning, and a PFOA environmentally friendly surface. Scanpan is fast becoming a favorite cookware brand of mine. Their nonstick surface is excellent and considered healthy. They recently introduced more product lines offering design and cooking appeal. They listen to customers! Their CSX cookware set includes both stainless steel and nonstick fry pans! You can't go wrong with Scanpan. Scanpan CSX Saucepan 67231600 , 2¾ qt., 2.75 qt. Scanpan CSX Saucepan 67231600 , 2 qt.